In a study published today, carbon accumulation rates of tropical forests biomass regrowth in areas of abandoned agriculture have been measured entirely from space for the first time. Study authors combined Landsat-derived maps of forest age with estimates of forest biomass based on data from the Geoscience Laser Altimeter System (GLAS). The estimated rate of biomass accumulation agreed well with estimates based on labor-intensive ground studies in the area.The scientists also estimated the biomass of the different types of old-growth tropical forest they mapped, including not only the lowland evergreen forest that typically comes to mind, but also swamp forests and the drier forest types that are present on hills and plateaus. Forest biomass is related to the amount of carbon that forests store. 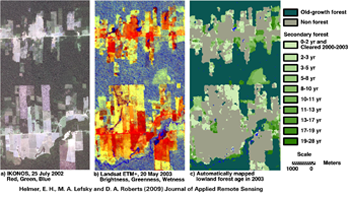 To map forest age, the authors developed a new automated method to interpret Landsat imagery. The method detects when forest begins to regrow on previously deforested lands, and it tracks the regrowing forests through time. The novel method avoids many of the time-consuming steps that are normally required to interpret this type of satellite imagery. The method also can identify secondary forest as old as 28 years from old-growth forests. Such older secondary forests are often difficult to impossible to distinguish from old-growth forests if only one image date is used. The new method holds promise for automating tropical deforestation tracking and forest regrowth over large areas. More work is needed to develop and test the method so that it can be used in mountainous tropical landscapes. IKONOS, Landsat ETM+, and lowland forest age images from this study. Image credit: Helmer, et al. High-resolution commercial satellite available on Google Earth was used to help validate maps of tropical forest type and age in an area of Rondônia, Brazil. These data enabled the scientists to identify forest types and distinguish different types of land cover for producing the maps. It is the first example of how Google Earth provides a new source of reference data for remote sensing applications related to forests. Dating back to the 1972, Landsat data the longest and most consistent record of tropical forests available. The Landsat series of satellites are operated by the U.S. Geological Survey and built by NASA, but some of the Landsat imagery was also provided by Brazil’s National Institute for Space Studies, which operates a Landsat image receiving station. The authors of the study include scientists from the U.S. Forest Service International Institute of Tropical Forestry, Colorado State University, and the University of California, Santa Barbara. Helmer, E.H., Lefsky, M.A., Roberts, D.A. (2009). Biomass accumulation rates of Amazonian secondary forest and biomass of old-growth forests from Landsat time series and the Geoscience Laser Altimeter System. Journal of Applied Remote Sensing, vol. 3, 033505. This entry is filed under Forest Management, News, Science Brief.